Our relationship with the bowl is both intimate and long. It is one of the oldest human made objects and it is used to prepare and contain our sustenance. I often see the bowl as a metaphor for people, with notions of containment and presentation. Our bowls are made using the lost wax casting process. Each wax is hand made and placed in a mould before molten glass can assume its final form. 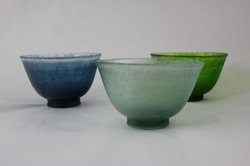 We make a variety of bowls from the small and intimate to the large and monumental.